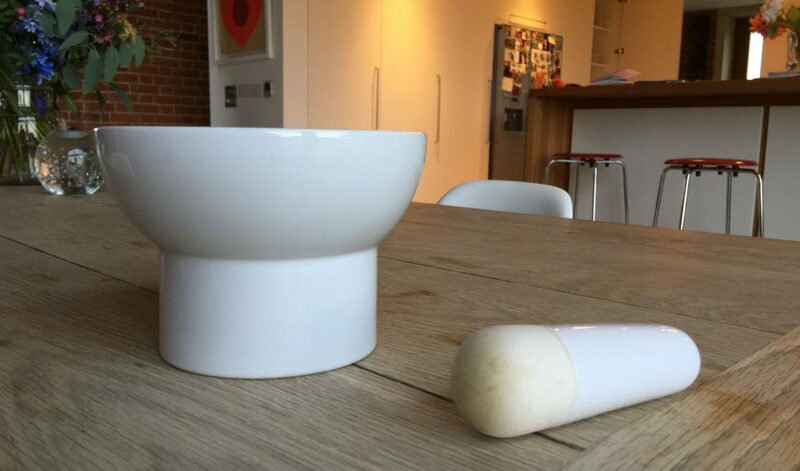 I think the pestle and mortar is a design marvel! Although they have varied dramatically in size and material throughout their long and impressive history, they are simple, timeless and, above all, amazingly enduring as the essential elements of design have remained more or less unchanged for several millennia. 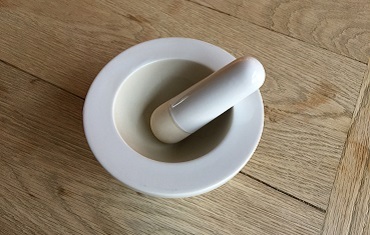 Evidence of the pestle and mortar dates back to 1550BC where it was once a key part of health care delivery – it was the first tool employed to make medicine and became integral to the development of pharmacology. Its uses have changed since then and, for many, it has become a popular choice in the kitchen. This beautifully effective tool has maintained its relevance remarkably well; even more so given the fact that we are in an era where specialised kitchen gadgets are soon replaced, made redundant or simply forgotten. All in all, the pestle and mortar is an elegant testament to the relevance and staying power of simple, well-designed objects. Mine (pictured) was given to me many years ago by my sister Annabel. It is the best design I’ve ever come across. It has a simple pared back aesthetic, is made from one material – a fine ceramic of a grade which results in a perfect grind and it is perfectly shaped to hold securely in one hand when using.